The history of Honda is one of Soichiro Honda, a Japanese talented engineer and businessman who loved technology and speed. His first steps into the business was the foundation of a factory in cylinder rings. Later on he sold that company to Toyota. He uses the money of that sale to realize a dream: create affordable transport for the common man. That is something which was lacing enormously during the first years after the World War II in Japan, where public transport was below standard and fuel was limited. Honda buys 500 engines which were build during the war to power electrical generators and rebuilds them so they can be used as a power source for a bicycle. Soon he starts to make complete "motorcycles" using these engines. Because of fuel shortages he let’s them run on turpentine. Despite the fact it means you need to paddle hard before the vehicle finally gets going, this invention sells excellent. This success results in the foundation of a real motorcycle plant in 1948: Honda Motor Company. 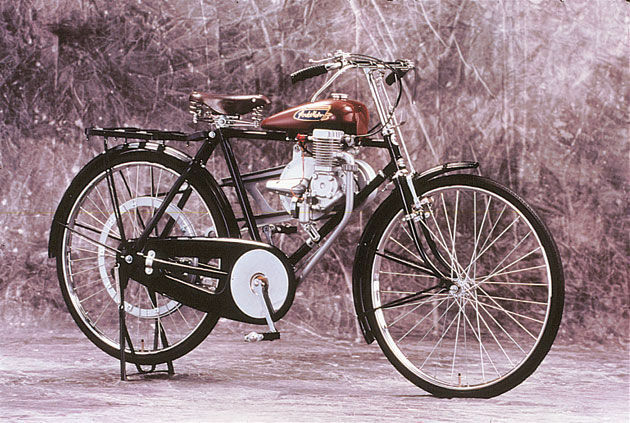 A year later, the first real Honda motorcycle comes from the assembly line: the D-Type. This motor, which makes Honda's dream come through, is also known as "The Dream". C & J stands for the names of Jeff Cole and Steve Jentages, two men from California who started with constructing frames in the early 70’s. One of the first frame they built by was made for stuntman Evel Knievel. The first motocross frames were built in 1972 after a distributor of Japanese motorcycles contacted them and brought an engine for which they had to build a competitive frame, the rider was Brad Lackey and he won the 1972 AMA Grand Prix with that particular frame. After this, Lackey left the States to participate in the World Championship in Europe and Brad Lackey became the first American World Champion MX on a C & J product. From that moment onwards their frames became very popular and were sold worldwide.